I woke up on the phone again this morning, the red numbers on the nightstand blaring 5:03. "Um, no. I'm off today...flying out tomorrow." At that point, the voice began snorting like Yosemite Sam did when he realized Bugs Bunny had outsmarted him. Leaving him to spin self-destructive circles in the newsroom, I dropped the phone and sank back in the covers, not the least bit curious as to why the early morning producer had called in the first place. Ninety minutes later, I stumbled out of bed and plopped down into my office chair. As I reached up to check my e-mail, a strange white glow caught my attention. Snow!...ish. Sure, grass blades were poking through the light dusting, but that's more than enough to send my fellow Southerners into an uncontrollable frenzy of closing schools, buying bread and wrecking cars. Of course, that's precisely the kind of chaos I make a living documenting. 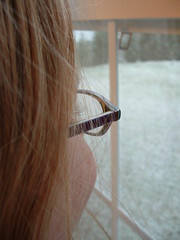 Thus I couldn't help but grin as I made a pot of coffee and watched my youngest child salivate at the window. For as long as I can remember, I have spent every snowy morning on the hunt for the freezing shut-in, the idling salt truck and the icy overpass. Not having to do so today is an unexpected pleasure I'm struggling to put into words. Now if you'll excuse me I have to wrap an eight year old in seven layers of insulated clothing so she can brave a quarter inch of snowdust to get a morning newspaper I'll spend thirty seconds perusing. But why do the math? I was foraging through the Viewfinder BLUES studios earlier when I actually found something to blog about: my inaugural Media ID. I remember the day my very first news director pulled me aside and told me with a gruff I'd be covering the Presidential visit to Eastern Carolina. "K-e-w-l", I thought, envisioning a one-on-one sit down with George Herbert Walker Bush. Little did I know then I'd be sucking tarmac fumes while Air Force One taxied to a stop a half mile away. No, as I sauntered down the hall to get my photo taken, I conjured up small talk for the Prez and I to share while the Secret Service guys yammered into their cufflinks. "Get my good side," I told the production manager as she fumbled with her Polaroid, "this one's for Herbert." The manager rolled her eyes and lined up the shot while I gave her camera my best thousand yard stare. The next day, I picked up my shiny new I.D. and admired it all the way to my afternoon ribbon-cutting. I'd arrived, I decided. 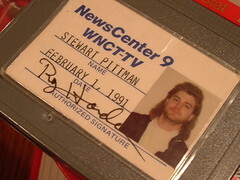 No longer some nameless studio schlub, I was an official member of the Fourth Estate, a swaggering interloper welcomed at crime scenes and fancy ballrooms, as long as I flashed that most prized possession from my velcro wallet. 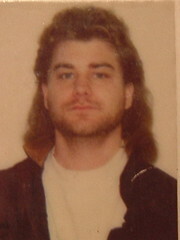 Strangely, the fact that I looked like a roadie from a .38 Special cover band didn't seem to bother me. Since then however, my kids have more than made up for it with their own special brand of shame. You ever look up from your workspace and see an exact replica of yourself toiling away for the competition? I do all the time, but only today did it weird me out. I was staring through the viewfinder when it happened. More accurately, I was admiring the dustmotes swirling in the background while the Principal in my lens spoke of car crashes and crisis counselors. With my camera perched on its tripod and my reporter locked intently on the educator's words, I was free to daydream and did. In fact, I ws near catatonic when the heavy door to the gymnasium lobby opened and caused my head to swing to the left. When my eyes gained focus, I could have sworn I was looking back in time. The reporter held the door while the photog squeezed through the space with his camera and bulky tripod. As they did, the school's basketball coach, a man whose DNA still lingered in my lens, greeted them. Respectful of our own ensuing interview and the subject matter at hand, the coach and reporter spoke in hushed tones while the photog set up his gear. Strangely, I was enraptured with this workaday scene. It certainly wasn't the first time rival news crews shared the news. Heck, I see some of my competitors more than I do extendede family members. Buy something about their 'Groundhog Day' appearance intrigued me. Perhaps it was the overwhelming similarities: Like mine, the other crew's reporter was compact, groomed and vaguely Latino. 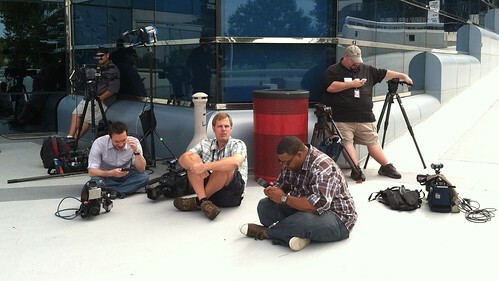 Like me, the other photog was scruffy, Caucasian and more than a little bored. When News Crew X interviewed the coach, I could almost read the reporter's lips as she asked the Coach the same questions we had a few minutes earlier. Nothing wrong with that; it was after all a run of the mill story about high school kids badly injured in an overnight car crash. Neither crew was breaking any new journalistic ground and we all knew it. But staring at the four of us just going through the motions made me think and I realized why, to the people we interview on a daily basis, we all look the same for a very good reason. Of course, I didn't let my lack of originality stop me from my appointed rounds. We soon left the gym lobby quietly, as not to interrupt the other crew as they took the microphone from the Coach and attached it to the Principal's lapel. In fact, I'd pretty much put the quiet interlude out of my mind, until about an hour later when I followed an impossibly vague set of directions to one of the injured boy's home. Who should be squeezing out of the humble trailer's door than our cross-town clones. We traded pleasantries as they packed up their gear and we unloaded ours, but I couldn't help but notice the other photog looking at me funny as they drove away and we climbed the mobile home's rickety stairs.